PRI is delighted to hear that its Board Member Professor Dirk van Zyl Smit will be leading a new global study on life sentences. Professor van Zyl Smit is Professor of Comparative and International Penal Law in the School of Law at the University of Nottingham, which has been awarded a £222,000 grant for the project by the Leverhulme Trust. As more countries move towards abolition of the death penalty, there has been a significant increase in the number of offences carrying the sentence of life imprisonment, often without the possibility of parole. More life sentences are being sanctioned by courts and people serving these sentences often experience harsher treatment than other prisoners. This study, the first of its kind, aims to understand for which crimes life sentences are imposed across the world, how such sentences are implemented, and the conditions under which prisoners serve them. It will also look at the human rights of those serving life sentences and how these rights are taken into consideration by the courts and prisons. This will include the controversial question of whether it is acceptable to impose irreducible life sentences and thus to imprison people without giving them some hope of release. It will also investigate cases of indirect life imprisonment, which may occur in countries that have no formal legal provision for life imprisonment, but may decide to extend sentences indefinitely for offenders considered to still pose a risk to society. The project will culminate in a book, Life imprisonment worldwide: principles, law, and practice to be published in July 2016. PRI is currently working on a two-year project to promote the progressive abolition of the death penalty and its replacement with humane alternative sanctions in 10 countries. In the context of life imprisonment, the project focuses on encouraging governments who have established a moratorium or abolished the death penalty to introduce fair and proportionate sentences which respect international human rights standards, changing society’s attitudes towards life imprisonment without parole and improving conditions of detention for those serving life or long-term sentences. 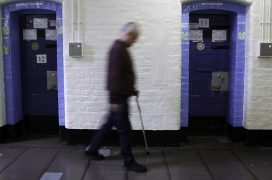 Read Professor Dirk van Zyl Smit’s blog for The Guardian (3 January 2013) on current UK government plans to introduce prison sentences of over 100 years.